PhD., Mathematics, 2008, Indian Institute of Technology Madras, India. M.S., Mathematics, 2003, Texas A&M University, College Station, USA. M.Sc., Mathematics, 1999, Indian Institute of Technology Madras, India. 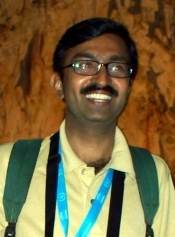 Assistant Professor, July 2009 – December 2011, Indian Institute of Science Education and Research Kolkata. NBHM Postdoctoral Fellow, July 2008 – July 2009, Chennai Mathematical Institute, Chennai, India. Researcher, Centre for Mathematical Sciences - Pala, January – June, 2008, Pala, India.